Yes, you have done it! You have finally built your mobile app. After this, you take a sigh of relief and wait for the downloads. You open your analytics and find there is no download. No one wants to download your app! If this is the problem, do not fear, most of the mobile application development company and owners are facing the same issue. If you have an app that is correctly developed, you can make the downloads happen. And once you have a significant number of downloads, you’ll be able to make some real money. But for all the minting, it takes a little effort and the right tactics to bring your app to the attention of the masses. So, before you learn about the tricks you first need to know how apps are downloaded in the first place. The very first thing that you need to know is about how app stores work. App store optimization is a bit different from Search Engine Optimization. They both are very similar but ASO has a greater impact that SEO has on Google. App Store Optimization increases the visibility of your app in the marketplace. The higher it ranks, the more users will find your app when they search. ASO also helps you in determining whether the user will download your app or not. There are some aspects that affect your App Store Optimization. The number of positive reviews in your app, the higher the rating will be. When a user ranks your app high, it will also be ranked highly on the App Store, improving the number of downloads. Apps consisting of popular keywords, title, and description, has more download. Regional success can influence your ranking. Backlinks done on relevant pages can help in improving app rankings. The number of people who uninstall your apps vs the number of who keep it within 30 days also have effects on the rankings. So, in order to maintain a retention level, make efforts towards your target audience in the app description. Expert custom web development companies in India, who offer digital marketing services always take care of the above-listed factors while planning their marketing strategy. 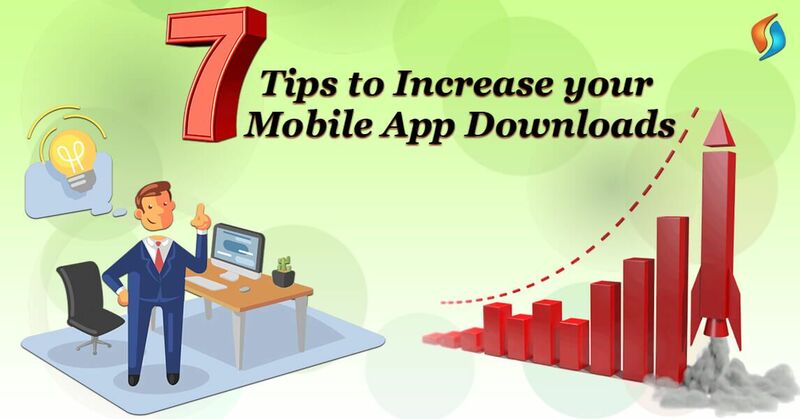 Now you know about ASO factors, let’s read about 7 tips that will boost your app downloads. Create a title and description in a way that when a user reads it, they should know what your product does. So, if you need your app title to stick in your user’s brain, it needs to be unique and appropriate. Another point to keep in mind is that the app store gives you the character limit, but you should only use 25 characters, as the search result shows only those numbers. And your description should consist of – information, benefits, features, and a call-to-action. Setup a marketing budget, don’t be conservative about it. Marketing strategies are the campaign for weeks or even months. But to get a sharp high in your app stats, budget your market spending in a specific time frame. You will notice after some time that a lot of traffic will come from organic search, and a lot of downloads will come from your website, to create a website as well. If you need expert Indian techies for enterprise mobility solutions, get in touch with us. Your app is the first thing that a potential user sees, so the icon design of your app should be eye-catching and serves a clear representation of your app. You should keep your app icon straight forward, and not too flashy. Know more about icon designing from our experts. To put this in simple words, your social media voice must match your app’s personality. Example: if your app is edgy then don’t bore your users with boring business language. And if your app targets young professionals then business speak might suit your audience. But don’t post information that only concerns your brand. Engage with your fans and provide information about your niche industry. If you need assistance in the social media marketing of your app, let our mobile app development agency help you out. One of the most important aspects of your app description is the collection of the screenshots, videos, and pictures. Screenshots of your app highlight the most important features of your app and will immediately encourage app downloads. Photos from the app are typically what users will look at after the first click on your app. And if you have the necessary tools, you can even design a video of your app. If you do not have specific tools, you can contact a mobility service provider for professional editors. Always remember you should never choose keywords because it has high search results. Any keyword that you chose must be accurate and relevant to your app and target audience. If you will stuff your descriptions with irrelevant keywords, your app will lose your credibility and your downloads will suffer. It is not only about the number of downloads, but it is also important to know – who, when, where, and how your app is used. In this case, analytics is very important to determine what kind of users want the most out of the app. Big data analytics inform you of the user’s behavior. They are also the key to generate continues downloads. Choose the best mobile application development company! If you want a professional mobility service provider to successfully apply all these tips to your app, consider to outsource mobile app development. Get in touch with our mobile app developers to drive some serious app sales. Talk to our experts today!